The tilt between Sweden and South Korea will be played at the Nizhny Novgorod Stadium in Nizhny Novgorod on June 18th. The Swedes got a favorable draw regarding the opening game at the tournament and if they want to be in the contention to progress to the Round of 16, the victory here is a must. The Taegeuk Warriors are labeled as outsiders in this group and will try to upset Sweden who will be under higher pressure to perform well and get three points. Sweden eliminated a former World Cup champions Italy in two legs in the playoffs to qualify to their 12th WC, first since Germany 2006, and their biggest success to date is the second place in 1958 when they hosted the tournament. The Blue-Yellow also has two third places and they failed to reach the Round of 16 on just three occasions, so making it to the planet’s best 16 teams is their plan here. On the other hand, South Korea made it to their 10th World Cup and ninth in a row, but they only advanced to the Round of 16 twice, including the 2002 WC when they co-hosted the championship, finishing in the 4th place. The Taegeuk Warriors recorded just one draw in the previous WC in Brazil and the experts believe a point out of three matches here is their maximum. Janne Andersson’s side played six international friendlies as a preparation for the tournament in Russia but won only one, against the neighbors Denmark, 1-0 back in January. 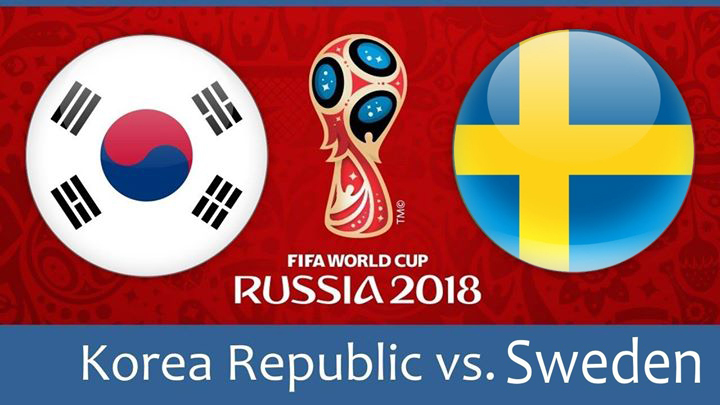 Sweden is without a victory in the previous three games and they failed to score a single goal in the process, which must be concerning prior to this tilt with the Koreans. Shin Tae-Yong’s men also experienced a bad period in 2018 as they defeated teams who are not taking the part at the WC, while losing to Poland, Bosnia and Herzegovina, and Senegal. South Korea didn’t score in the last two clashes with Bolivia and Senegal. Without retired Zlatan Ibrahimovic, there is no a true star in Sweden squad, but the midfielder and No. 10 Emil Forsberg is the most important player at the moment, and Red Bull Leipzig’s man has the ability to make something out of nothing, including his excellent skills from set-pieces. Without a doubt, the biggest star and the leading scorer of this generation, Son Heung-min is the player to watch for South Korea not only in this game but also at the entire tournament, because if somebody could lead them to the Round of 16, that is Tottenham’s forward who has 21 goals in 67 international caps. These sides met twice before in friendlies in 2005, and both games ended without a winner, and although it could go that way this time around as well, I am giving a slight advantage to Sweden, which I believe, represents a better option than playing on the goals.